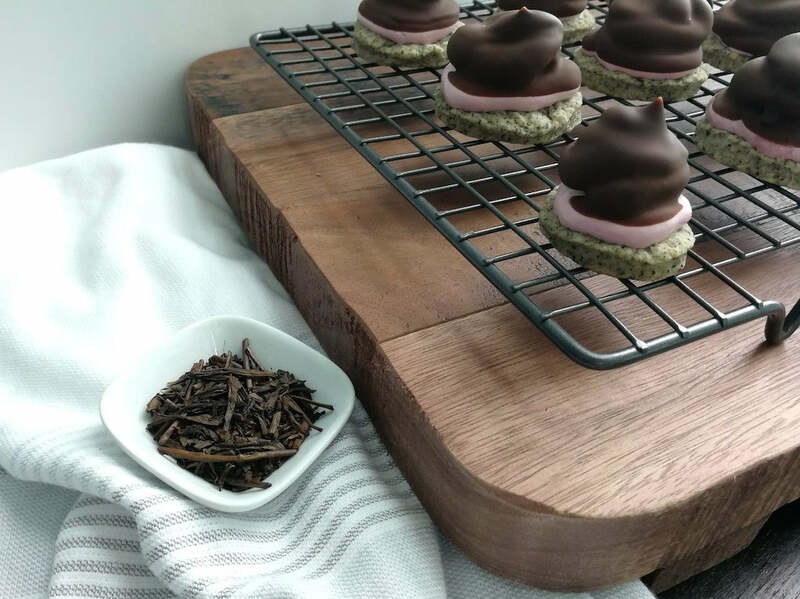 Chocolate-Coated Marshmallow and Hojicha Treats – Hojicha Co.
You may know these are Mallomars or maybe you know them as Krembo. Either way, read on to learn how to bake this universally loved treat. First, you’ll bake the round hojicha cookie base using freshly ground hojicha powder. While the hojicha cookie tastes great on its own, it tastes even better topped with a mountain of marshmallow fluff. The heavenly pink cloud is made from aquafaba meringue and delicious natural food coloring from raspberries. Finally, the whole thing is dipped in decadent chocolate to create a thin chocolate shell. Then all that’s left is to take a bite, because these chocolate-coated marshmallow and hojicha treats taste even better than they sound. Prepare the hojicha cookie base by preheating the oven to 180°C / 350°F. Grind 2 tablespoons of loose leaf hojicha using a spice grinder, coffee grinder, or the grind function of a food processor. Add freshly ground hojicha powder, ½ cup + 2 tablespoons unbleached all purpose flour, and ½ teaspoon baking powder to a medium bowl. Mix and create a well in the center. Add 2.5 tablespoons coconut oil to a small saucepan, and melt over medium-low heat. Pour the melted coconut oil into the dry ingredients along with 2 tablespoons maple syrup and 1.5 tablespoons non-dairy milk. Mix until a dough forms than transfer to a floured surface. Knead the dough for a couple of minutes until smooth and elastic. Roll out the dough to ¼ inch thickness, then cut using a round cookie cutter. Transfer ready to bake cookies to a parchment-lined baking sheet, and place in the freezer for 5 minutes. Cool on the baking sheet for 5 minutes, then transfer to a wire rack. Prepare the pink marshmallow fluff by simmering 1 cup frozen raspberries and 2 tablespoons water in a small saucepan and over medium-low heat. Strain the bright red liquid, and reserve the raspberry seeds and flesh for another recipe (or your next smoothie!). Set aside to cool. Add ¼ cup organic golden sugar to a blender or food processor and blend until fine and powdered. Set aside. In a large bowl, beat 65 ml aquafaba and ¼ teaspoon organic apple cider vinegar on medium speed until firm peaks form. Continue beating and gradually add the powdered organic golden sugar one tablespoon at a time. Once stiff peaks form, add the raspberry food coloring one tablespoon at a time until the mixture reaches your desired color (approximately 3 tablespoons). Pipe the pink marshmallow fluff onto the cooled hojicha cookie base and place in the freezer for two hours. Prepare the chocolate shell towards the end of the two hours. Melt 100 g dark chocolate in a double boiler. Transfer melted chocolate to a tea cup for dipping. Working quickly with one cookie at a time, hold a cookie up by the base and turn upside down over the melted chocolate. Avoid touching the soft marshmallow fluff as it never fully solidifies. Dip the cookie quickly into the melted chocolate top first. Either leave a portion of the pink marshmallow fluff undipped, or cover it completely for a sweet surprise. Drip off any excess and only then place upright. Store chocolate-coated marshmallow and hojicha treats in the freezer until ready to eat.